With smart CTAs, you can display a customized button to your different visitors based on data stored on their HubSpot contact record, or based on information known about their device type, country, referral source, or preferred language. 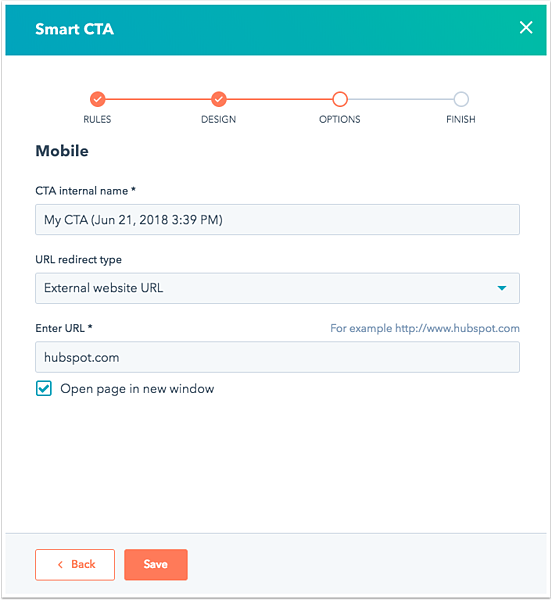 Follow the steps below to create a smart CTA that you can use on your HubSpot pages or on your external website pages. Hover over the CTA you would like to edit and click Actions > Create smart version. This CTA will be the default content that a visitor sees if they do not meet any of your smart rule criteria. In the pane that opens on the right, select the radio button next to the criteria you want to base your smart rules on. 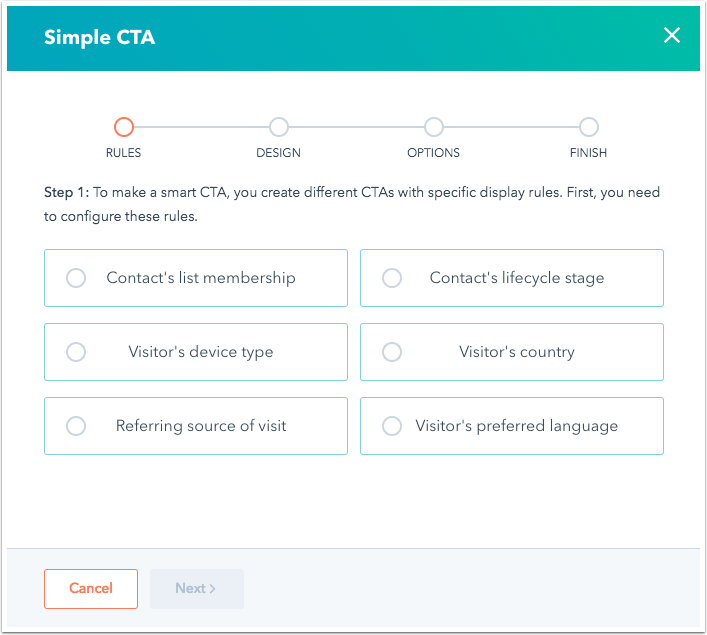 Click the dropdown menu to configure your smart CTA rules. For example, if you select Contact's lifecycle stage as your rule type, select the lifecycle stages you would like to target in the dropdown menu. On the next screen, enter a CTA name. Click the URL redirect type dropdown menu and select a URL type. Depending on which redirect type you select, enter the external website URL, upload a file, or select the HubSpot page or meeting link from the dropdown menu. Review your completed smart CTAs. Click Add another smart version to add a new smart CTA. Click Reorder rules to reorder your rules. When you're done, click Finish. Please note: CTA variations do not display on posts when AMP is enabled. If you have used an A/B test CTA or a smart CTA, the default version of your CTA will appear on the post. Over time, you can analyze your smart CTAs performance and make any adjustments to ensure you are successfully tailoring content to your different website visitors. 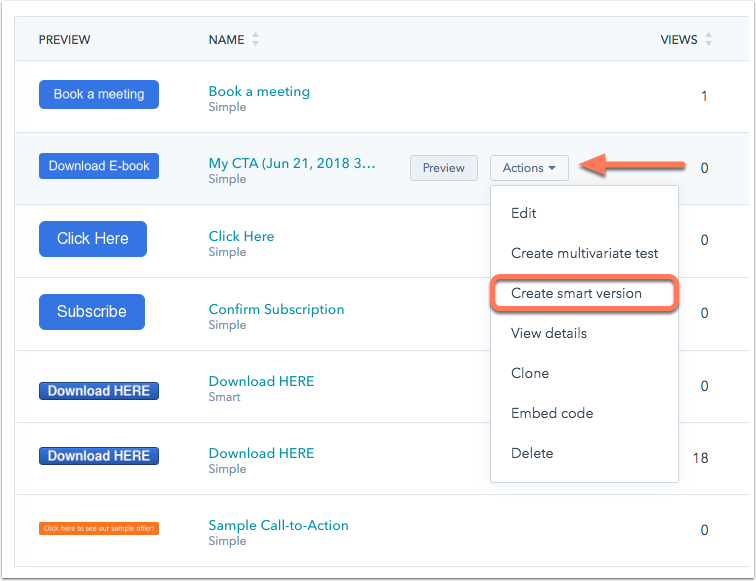 If you're a Marketing Hub Enterprise user, you can also A/B test your smart CTAs to determine which one is performing the best.